Here's the Everybody Wins deal. 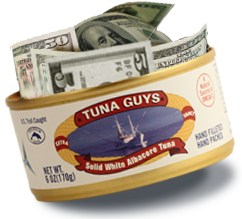 As a valued customer of Tuna Guys, we want you to spread the word about our great gourmet tuna to your friends and family. Just enter your email address below to get your personal referral code and a $5.00 instant credit. Every time a new customer orders usings your code, they'll get a $5.00 discount and you'll get an additional $5.00 credit to use on your next order.